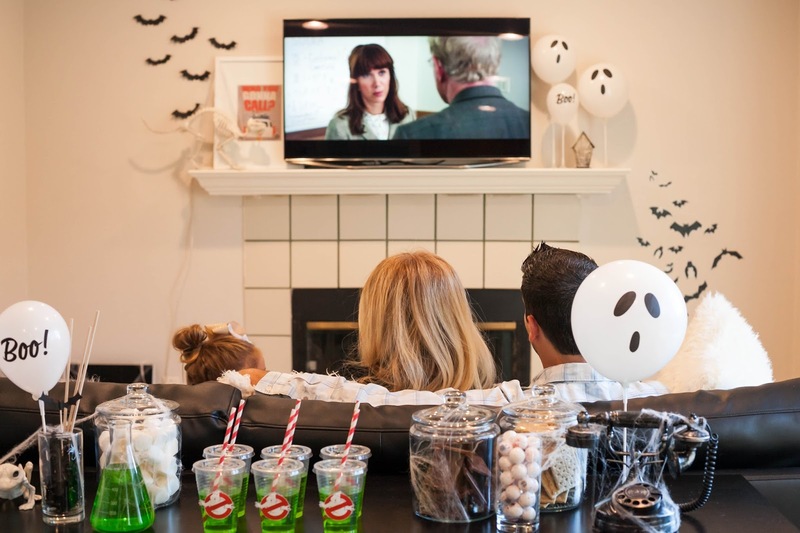 Movie nights are a way to get the whole family together and it totally gives me the excuse to make it FUN! 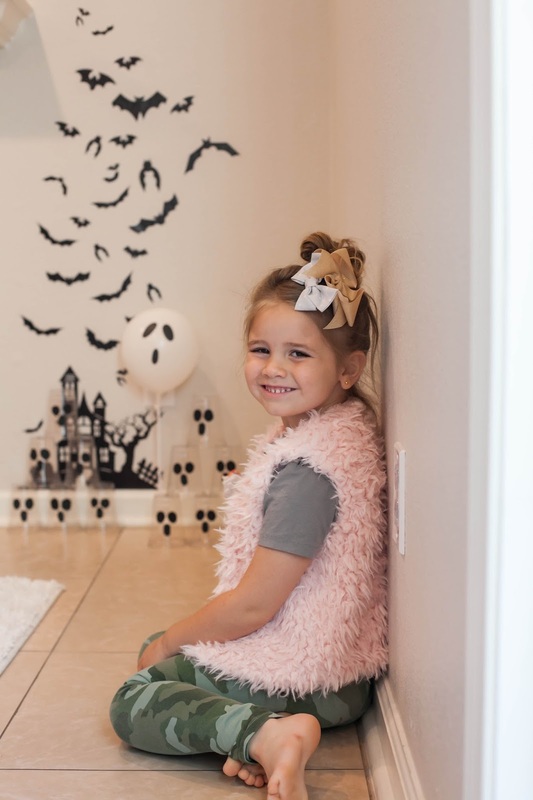 I am all about creating memories with food and whatever I can find at our favorite stores :) Halloween is becoming Aden's favorite holiday and Adie is obsessed with the bats. 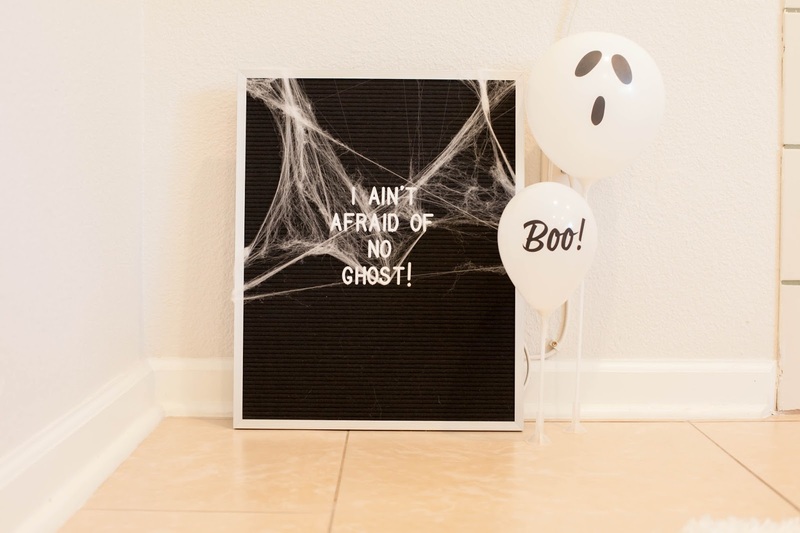 When I plan any party I instantly grab my phone, Pinterest, and Google are my go to. 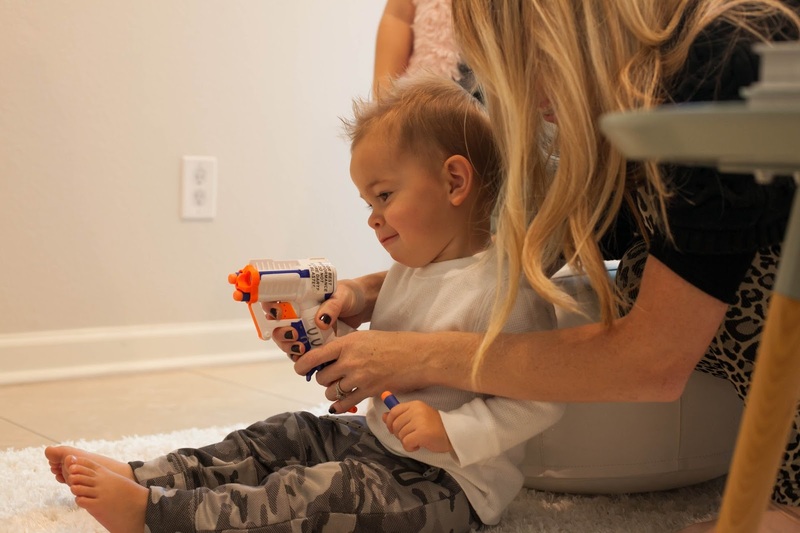 Having an unlimited data plan with Walmart Family Mobile lets me plan for days and the PLUS plan fits our busy lifestyle, giving us the extra data we need. 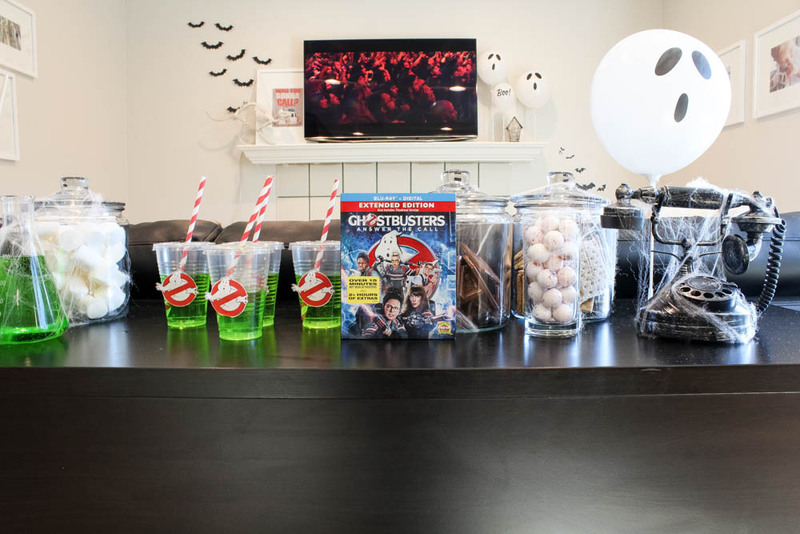 Since the new release of Ghostbusters [the extended edition with over 15 more minutes not seen in theaters plus over 3 hours of hilarious extras] at Walmart on Blu-ray, DVD and 4K Ultra HD, I knew movie night had to have ghosts, green drinks and chocolate. 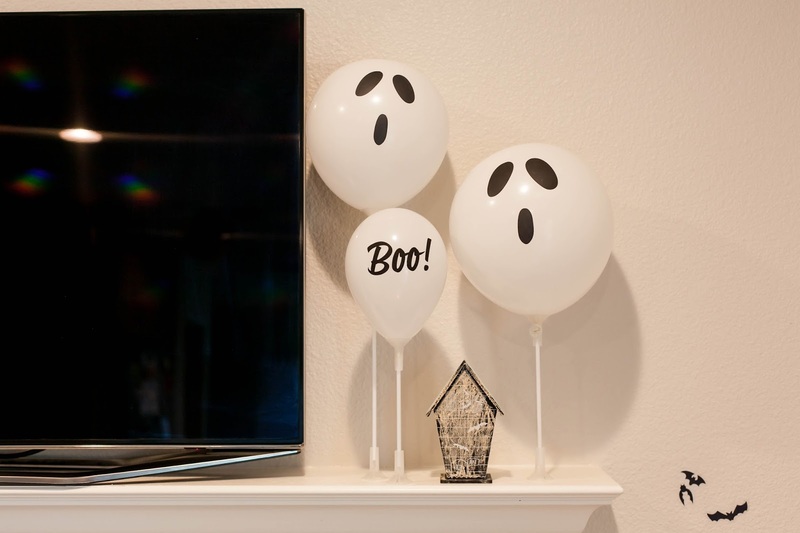 The ghost balloons are my stinking favorite and we ain't afraid of no ghosts! 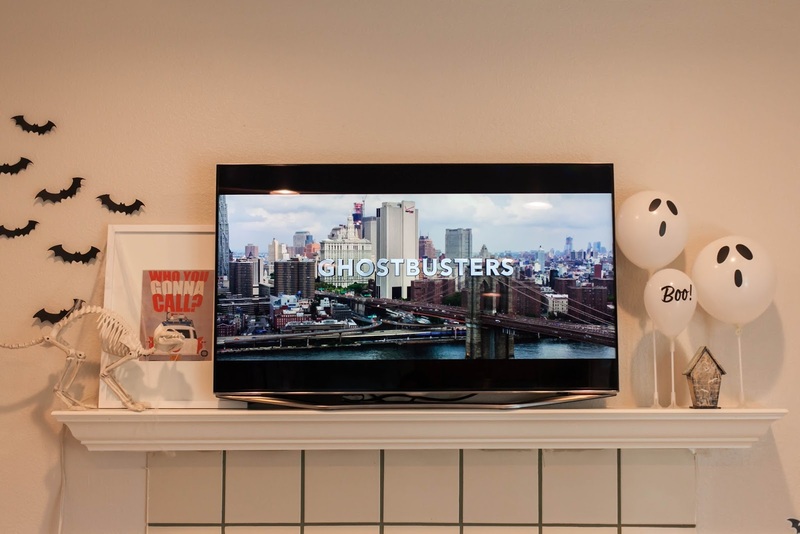 I printed out my favorite Ghostbusters picture, framed it and added spider webs. Bats are so fun and every haunted house usually has them, in the movies anyways :) so Adie helped me put them up. 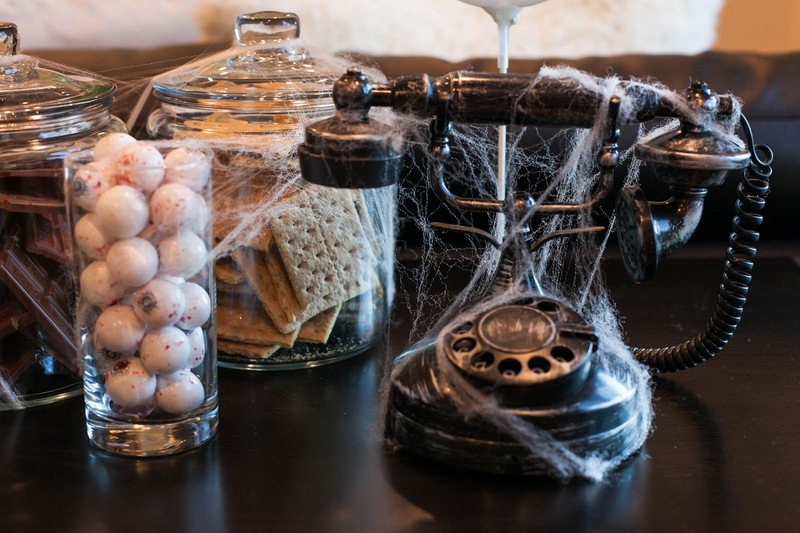 The old style phone we found was perfect, it definitely goes with the theme of calling ... Ghostbusters! 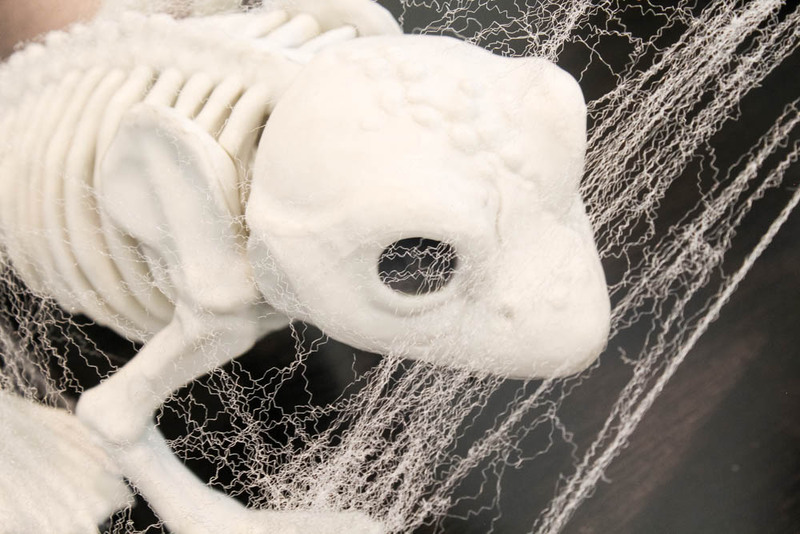 I love spider webs, everywhere and it really makes things feel spooky! 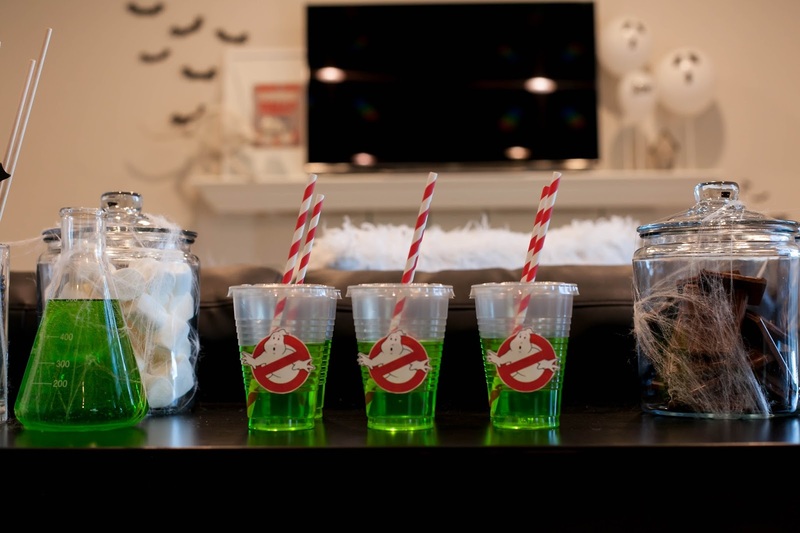 Adding green food coloring to water, cutting out no ghosts with our favorite paper straws makes the best beverage for your little people! 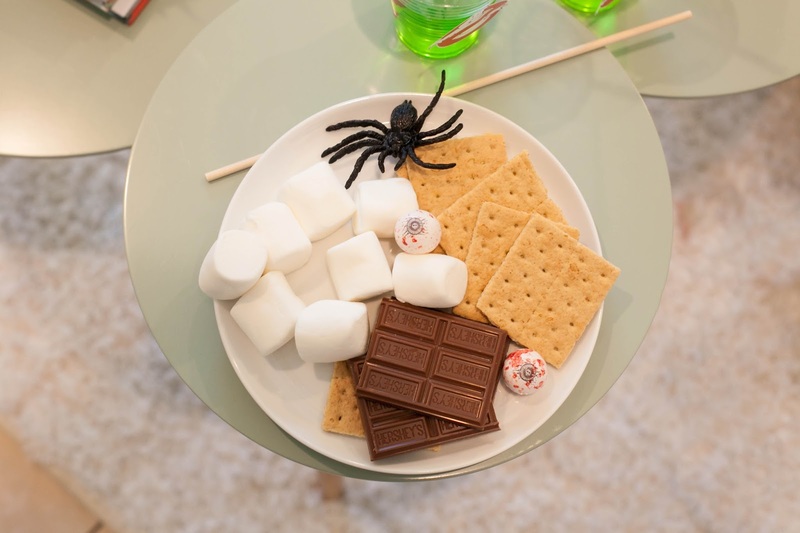 We did s'mores and I love putting anything in glass jars! 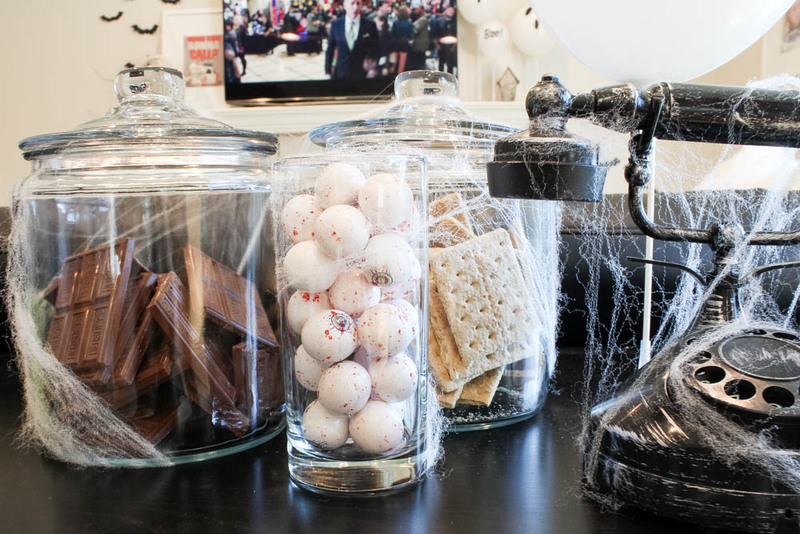 You can definitely decorate with food and chocolate always looks good! 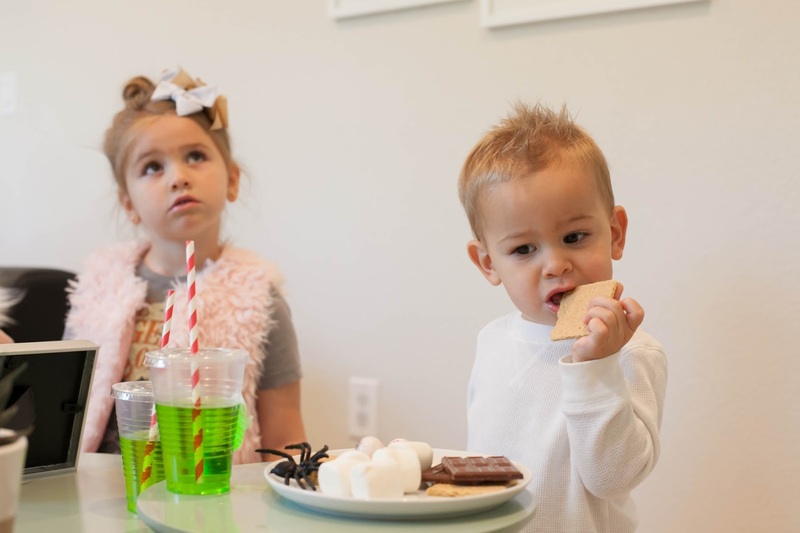 Adie was marshmallow obsessed and Aden always had a graham cracker in each hand. 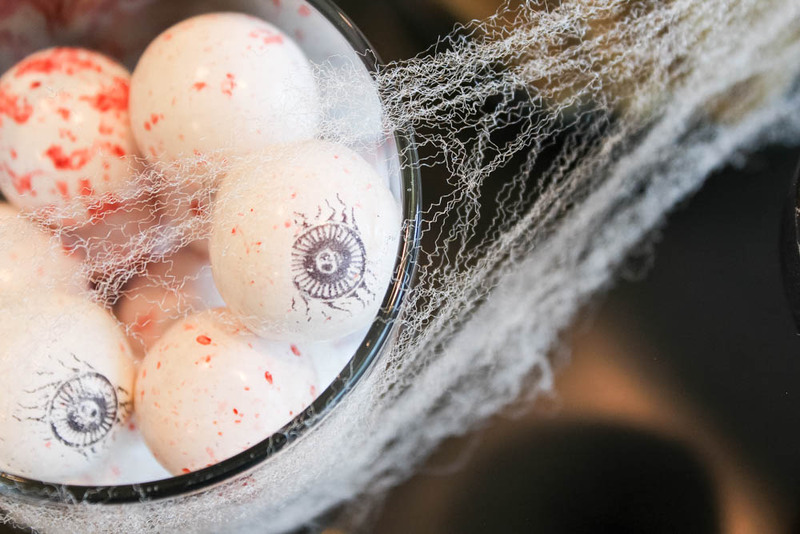 Bubble gum eyeballs just adds to the spooky-ness of Halloween. 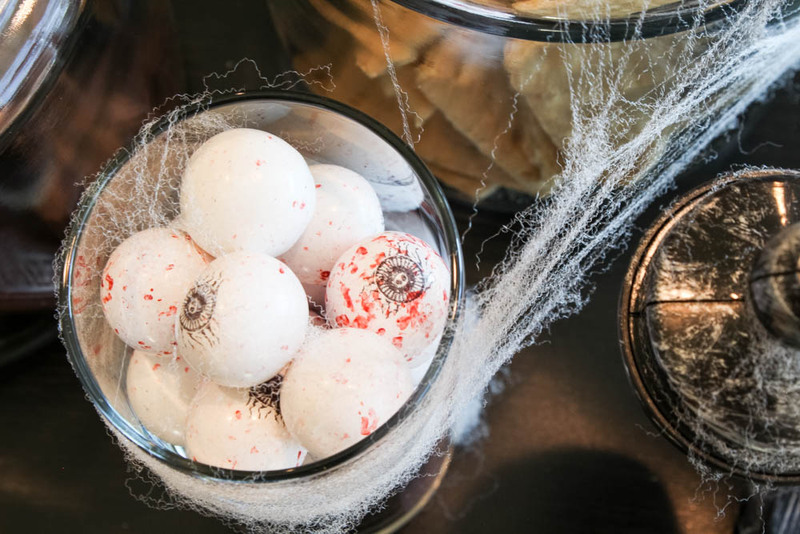 A glass full of spiders holding the s'more sticks and a skeleton frog make any table more fun. 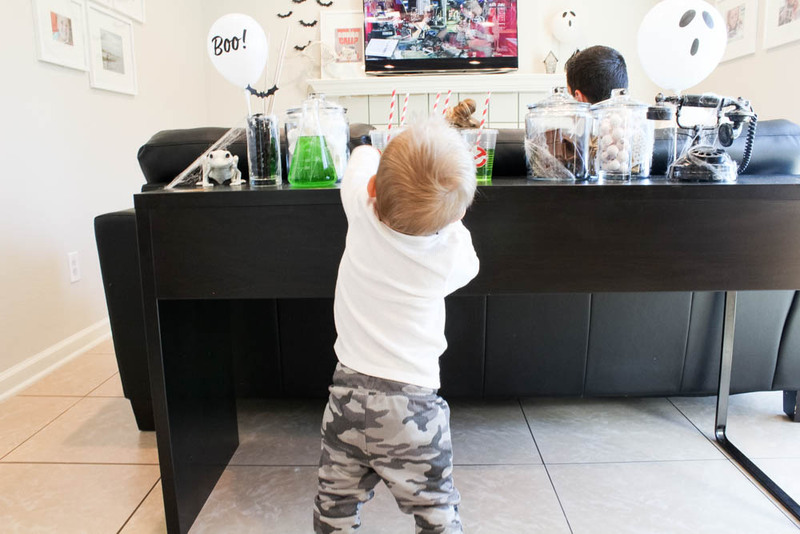 We love a good game at our house so we made a fun bowling game for my two little people! I just grabbed clear cups, cut out eyes and mouths from black paper, used glue dots to attach them. Stack the cups however you'd like and shoot them down with your favorite nerf guns! It was so fun to play with Adie and Aden and it gets everyone involved. They loved it! :) which I loved watching them play together so movie nights are a must! 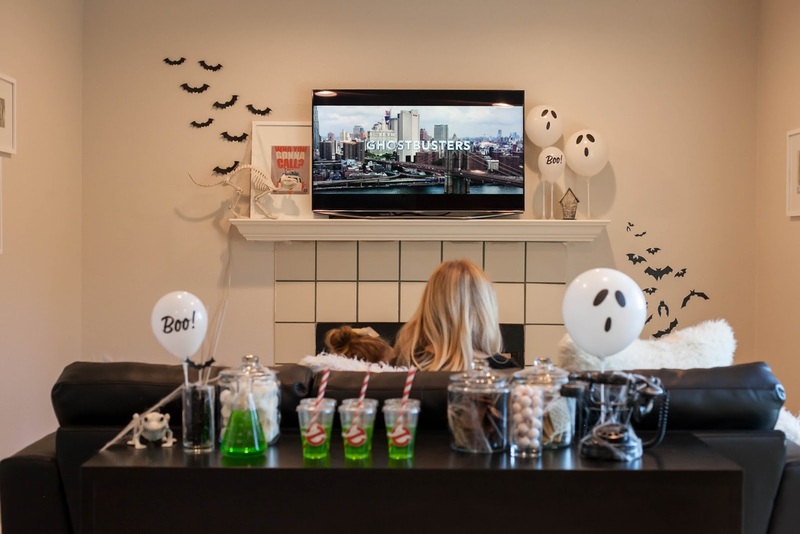 Adie kept asking every night if it was time to have movie night, so I love how she gets as excited as I do over the little moments that mean the most. As much as we are on our phones the Walmart Family Mobile PLUS Plan with Unlimited Talk, Text, & Data which includes up to 10GB of 4G LTE plus a free movie on VUDU every month [$7 value] per line for $49.88. The plan includes more data at a value with 10GB of 4G LTE. I am always [hate to admit it but...] on my phone with Instagram, checking my emails and with Adie and Aden [blog] so the 10GB of 4G LTE is exactly what I need to keep connected. 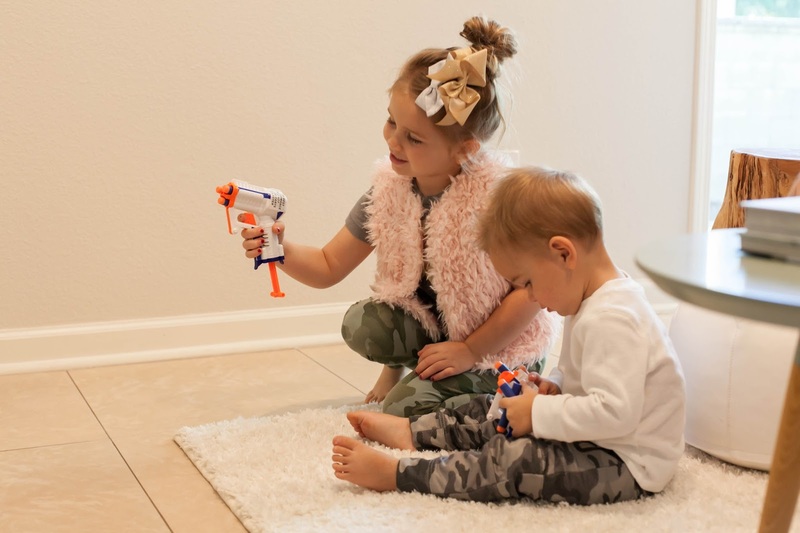 Adie loves watching Netflix or playing Toca Boca which can provide a little bit of Mommy time to enjoy a Dr. Pepper! :) The Samsung On5 is my favorite and for 119. dollars + the Nano starter kit you could be making calls on your way out of Walmart! Getting one free movie every month on VUDU means more movie nights! It's easy with your Walmart Family Mobile Plus plan and your free VUDU movie each month [$7 value, same as a new release rental] You can definitely make this something your family looks forward to every month! I never need an excuse for a party! It's so easy to get started which I love, purchase the Nano starter kit [$19.88 rollback from $25] and start service on ANY plan today for $19.88! 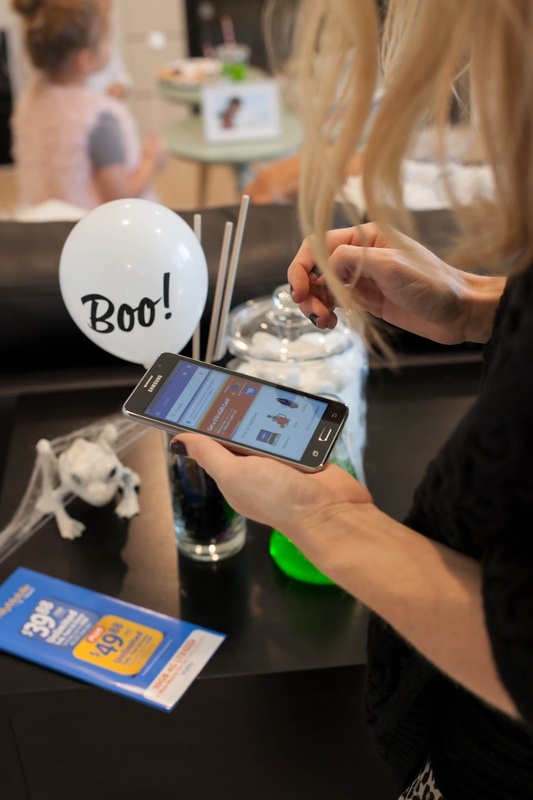 To learn more about Walmart Family Mobile, check out one of the in-store events happening near you. 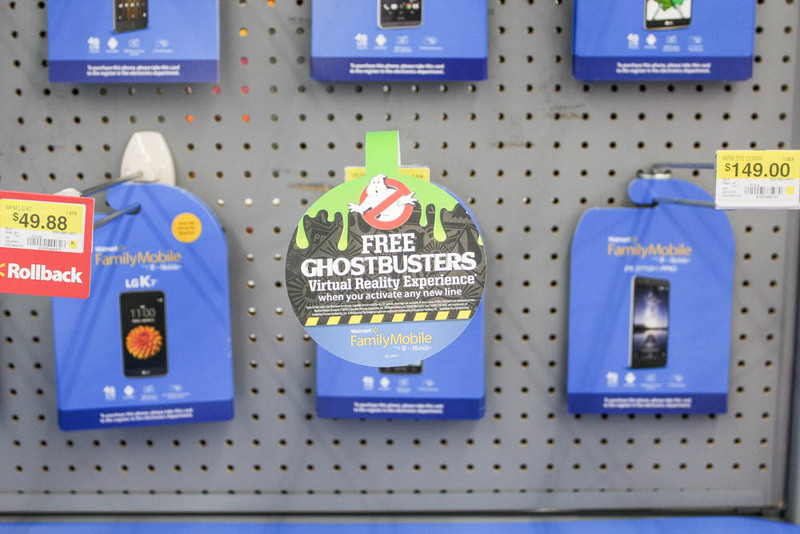 Experts will be on hand to explain how to activate a new line and you can see the free Ghostbusters Virtual Reality Experience for yourself. While you’re there, pick up a brochure with details on the plans and VR experience and a plastic 3D hologram. To find an event near you, visit the Walmart Family Mobile Hub. 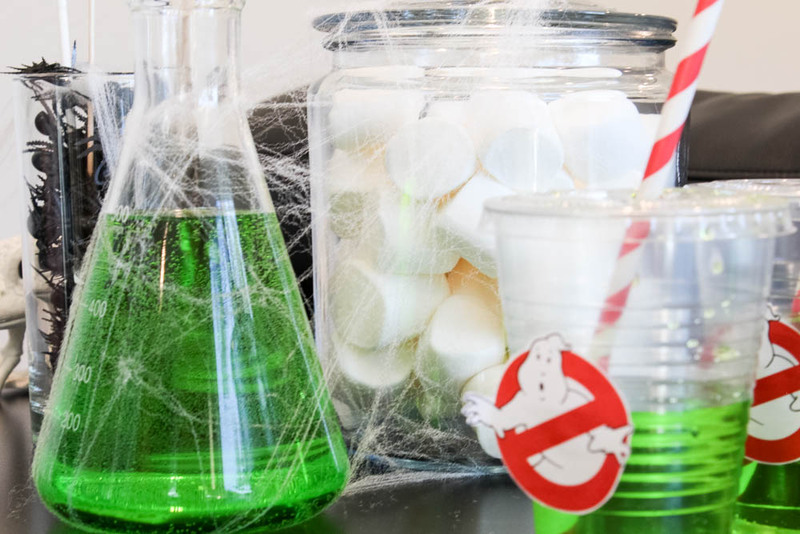 Any customer who activates a new line this month will receive a code providing a free download of the Ghostbusters VR Experience, which gives users the unique experience of firing a proton pack and looking at ghosts straight in the eye. To take advantage of this VR Experience, you just have to purchase your Walmart Family Mobile product, go online, register your phone and redeem the code you received when you purchased the phone. Then you just download the app from either the Apple Store or Google Play and pretend you’re a Ghostbuster! Disclaimer: All prices for phones and plans included in this post are accurate as of the date of posting; however, these prices are subject to change. Please refer to http://cbi.as/5jo2h or your local Walmart for current pricing. 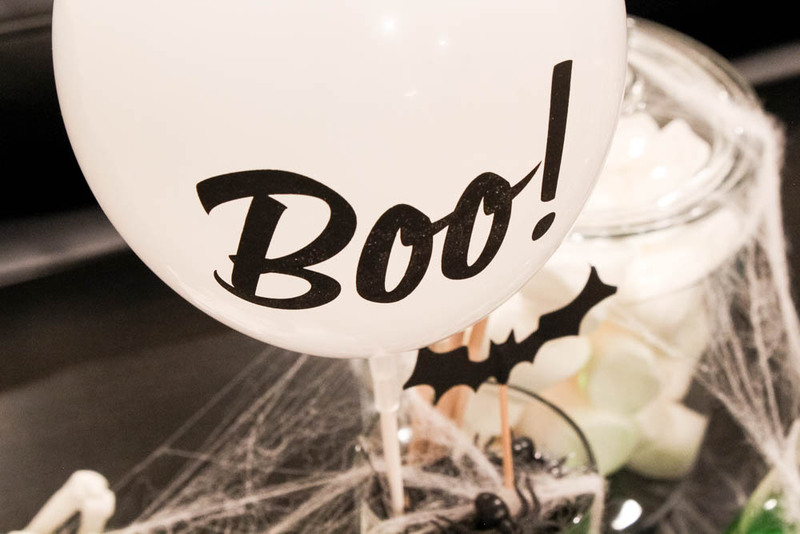 Some fun pictures by gina_b_photography and Happy almost Halloween! -XO!